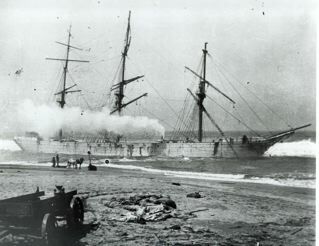 Photo: Shipwreck of the New York, March 1898. The Coastside of the 1880s was a place defined by legend and lore, of wild bears, colorful rancheros and mountains that reminded some of the recent Italian immigrants from the old country. But the most popular legends were those surrounding the shipwrecks, unfortunate vessels–that due to fog and poor technology lost their way, often crashing on the jagged rocks. These disasters brought the community together. There was a system in place for alerting the locals, providing medical help and unbounded hospitality to survivors….as well as the always profitably salvage operations that redistributed the ship’s assests to the locals. Horace Nelson had romanticized about being part of an exciting rescue and salvage shipwreck operation. He had married well–and was respected as a successful cattle rancher when, March 1898, his wish came true and the famous iron vessel “New York” was stranded on the beach at Half Moon Bay. This ill-fated ship carried a full cargo from China, including silks, cloisonne, firecrackers, rice and tea–perhaps providing locals with the biggest salvage operation ever. It seemed fitting that Horace Nelson salvage the “New York’s” bell, placing the magnificent symbol among his beloved dahlias and artichokes in the front yard of the his Victorian house on Main Street for all to see.